Boston has a large network of conventional bike lanes, which are 4 to 6 feet wide and along a curb or next to car parking. This type of bike lane is a great tool to make Boston’s transportation network more inclusive, connecting residents to jobs, open space, local shops, schools, transit, and more. As we’ve added bike lanes to streets across the city, we’ve seen more and more people choose to ride a bike to work, to the T, to farmers markets, or just for fun. But we know that many people don’t feel comfortable riding a bike on our streets. We want to do better–and are working to bring better bike lanes to Boston. By providing better bike lanes, we’re not only providing comfortable, safe places for people biking on our streets, but we’re also making the streets safer for everyone. SO WHAT ARE THESE BETTER BIKE LANES? 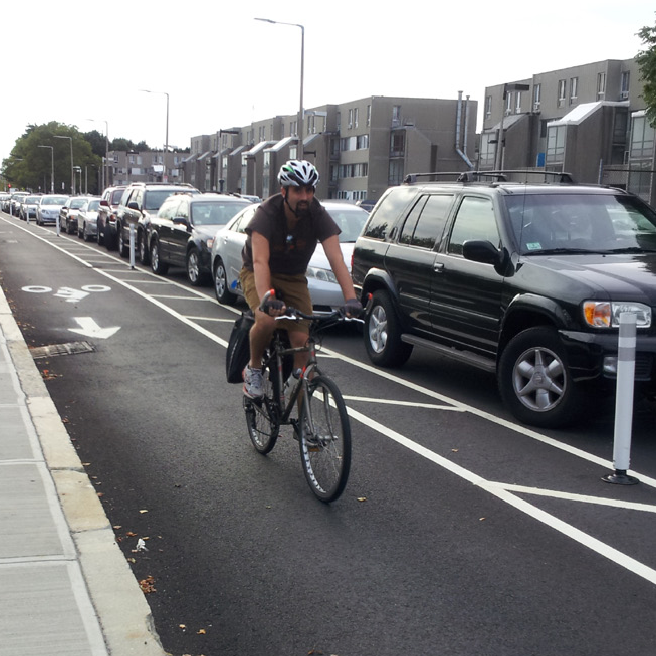 Buffered bike lanes provide more space between people biking, people driving, and/or parked vehicles. These buffers are usually 1 to 2 feet wide, and located one or both sides of the bike lane. When buffered bike lanes are located adjacent to car parking, the buffer provides a bit more space for people to open their car doors without unexpectedly hitting a person biking. There are no vertical elements to separate these lanes. 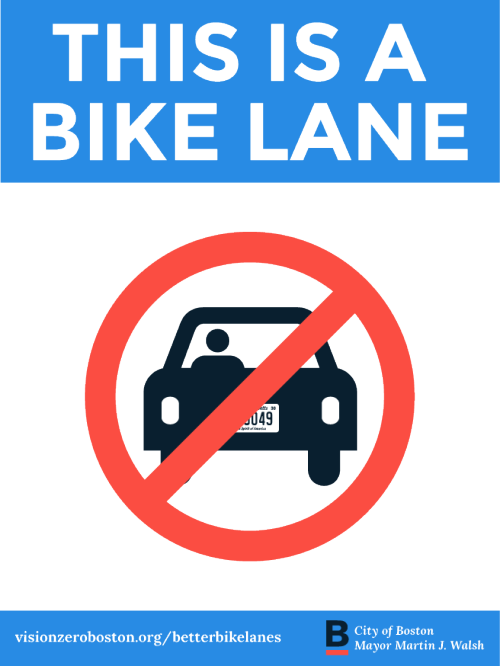 Separated bike lanes are similar to buffered bike lanes in that they provide more space between people bicycling and those driving or parking cars, but separated bike lanes also provide vertical separation between people on bikes and people in cars. There are many ways to provide the physical separation. In locations without on-street parking, when we’re not re-constructing the street, we use flex posts to delineate the separated bike lane. We may expand to other types of vertical objects in the future. When we are reconstructing a street, we can use curbs to physically separate the bike lanes from the travel lanes. Where there is on-street parking, we can locate the separated bike lane between the parked cars and the curb. We sometimes call this type of bike lane a parking-protected bike lane. This placement reduces the risk of crashes due to opened car doors, means people on bikes don’t need to swerve into the travel lane to avoid cars parked in the bike lane, and helps to make bicyclists a bit more visible to turning vehicles at intersections. After exiting cars, people should look for people on bikes before crossing the bike lane to the sidewalk. Unless otherwise signed, all parking rules remain in effect, including parking meter fees and resident permit parking. As always, bicyclists must yield to pedestrians crossing the street. On some projects, we will install sidewalk-level bike lanes. Designated for use by people riding bikes, these lanes are at the same height as the sidewalk. People should not walk along these lanes, but are able to cross them to access bus stops or parked cars or to cross the street. Bike-riders must yield to pedestrians crossing the bike lane. As a reminder, bike lanes can be built in many different configurations and go by many names, but at the end of the day they’re still lanes for bikes and no one should drive* in them. When driving, you should always check your mirrors and look back before changing lanes, turning, or opening your car door. When biking, you should avoid riding in vehicle blind spots and be sure to use lights at night. Whether driving or biking, always yield to people walking and be considerate of other road users. *We make an exception for emergency responders and people who we’ve been hired to sweep and plow.